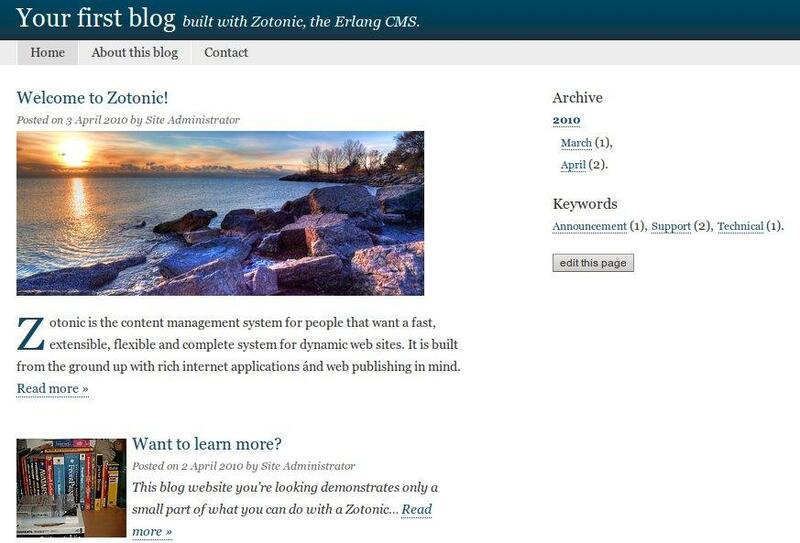 Zotonic, The Erlang CMS from Peet Sneekes on Vimeo. You can use and install Zotonic under Linux, BSD or Mac OS X. Windows isn't officially supported (but it should work). Details are in the documentation. Now I'll show you a quick path to get Zotonic up and running under Linux. Zotonic needs some packages to work. First is Erlang R13B or newer. Also ImageMagick and PostgreSQL are required. That shouldn't be a problem for most modern distributions. When you installed them fetch Zotonic package and unpack it somewhere. Where "YOUR_PASSWORD_HERE" replace with your password for the DB (don't forget it). Where "SITE_NAME" is a site identifier used by the system internally (no spaces and special characters). Under priv/sites/SITE_NAME/config you will find a config for the created blog. In this file set the correct database password. You can also change admin account password from "admin" to something else. Master admin account password is stored in priv/config. This account allows managing websites running under Zotonic. I had a quick run with the Zotonic system. The admin panel has a lot features, but isn't complex. There is a lot of handy JS widgets that improve the usability. Multilingual content is also nicely done. Out of the box it has more features than Wordpress. Of course Erlang is bit exotic language for daily web hacking. It has a lot of strong features, but still it's not very popular yet. Using Zotonic for one simple blog may be an overkill, but if you want a high end big blog/website platform then why not. At some point Erlang developer may be needed, but on the fronted you get nice and clear Django-inspired templates. Zotonic is used by blogs and websites like erlangcamp.com, blog.beewise.com, totally-erlang.com or garbett.org. Zotonic is also supported on maxclass.com.